The auditorium in the John F. Kennedy Presidential Library was buzzing. Across dozens of tables, over 500 people shared their stories. Stories about losing someone close. Stories about the gift of having the conversation. Stories about not discussing end-of-life wishes until it was too late. As we know too well, this is a conversation that many people, including end-of-life care experts, struggle with. But at their tables, attendees were engrossed in discussion and excited to share how their organizations could contribute to changing the culture in this area. It took a mighty effort to quiet the audience and bring attention back to the distinguished panelists on the stage. These health care leaders came together in May for the inaugural summit of the Massachusetts Coalition for Serious Illness Care. The coalition is dedicated to ensuring that every resident in the Commonwealth receives care in accordance with their goals, values, and preferences – at all stages of life and in all steps of care. The coalition, convened by The Conversation Project, Blue Cross Blue Shield of Massachusetts, and Ariadne Labs, is co-chaired by Maureen Bisognano, President Emerita and Senior Fellow at the Institute for Healthcare Improvement, and Dr. Atul Gawande, the best-selling author and Executive Director of Ariadne Labs. To date, the coalition includes 58 diverse health care organizations from across the Commonwealth. 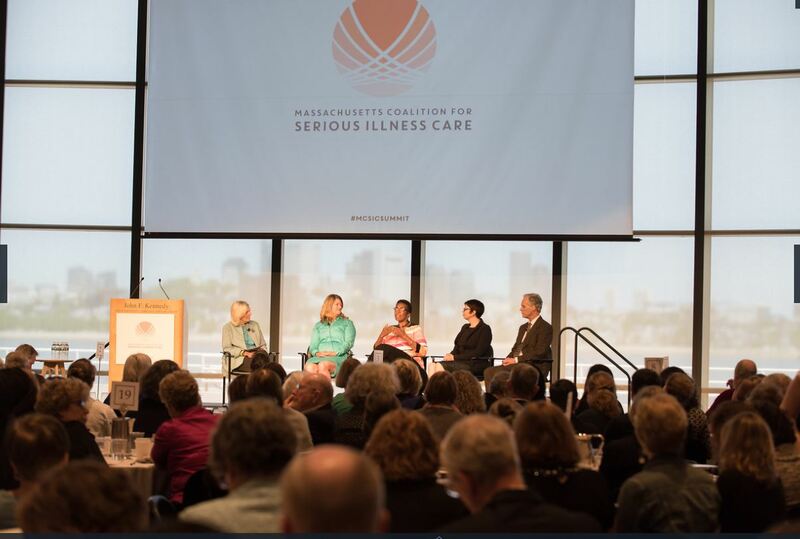 Leaders from these organizations, as well as from the faith community and the financial services industry, came to attest to the importance of this work and explore how to collaborate to improve serious illness care in Massachusetts. Members of the coalition will focus on having everyone in the state over the age of 18 designate a health care agent and have a conversation with that agent about their unique wishes for care at the end of life. The coalition will also work to provide Massachusetts clinicians with the training necessary to facilitate high-quality conversations with patients about advance care planning and serious illness. There is a great need for this work in Massachusetts. A recent survey commissioned by the coalition shows that there is a major conversation gap in the Commonwealth. While over 80 percent of those surveyed said that physicians should discuss end-of-life care issues with patients, only 15 percent had discussed their wishes with their health care provider. Of the respondents who had a loved one die in the last 12 months, about a third said their loved one’s wishes were not fully honored by health care providers. The coalition aims to move the needle on serious illness care in Massachusetts and make the state a leader for the nation on this issue – as it has been for health care in the past. Throughout the summit meeting, the inspirational remarks by Andrew Dreyfus, President and CEO of Blue Cross Blue Shield of Massachusetts, Dr. Atul Gawande, Governor Charlie Baker, Ellen Goodman, and all of the leaders in attendance made it clear that this group has the vision, the resources, and the will needed to transform serious illness care in Massachusetts. Andrew Dreyfus noted that, for the first time, “We are no longer working alone on this issue. We are all united.” Almost 55 years to the day after President Kennedy announced his goal to put a man on the moon, it seemed only fitting that the coalition declared its own ambitious goal in the library named for him. Hello, I am a palliative care coordinator at a small community hospital in California. I am always looking for additional information to present to our administration in an effort to educate and hopefully gain support for our program. I recently read an article regarding testimony from Atul Gawande, M.D., MPH, author of the seminal end-of-life book Being Mortal,before the Senate Special Committee on Aging. In the article there is mention of his endorsement of six measureable goals for end-of-life care launched by the Massachusetts Coalition for Serious Illness Care. I was wondering where I might find these measurable goal? Thank you so much. This is a good reference. Note “Resources” link under “Serious Illness Care” on left side of page. In my book, Spirit Matters: How to Remain Fully Alive with a Life-Limiting Illness, I offer a seldom considered but all important perspective on what really matters at the end of life. As a retired hospice nurse and now a speaker on end of life care I focus on the importance of keeping the spirit-the person inside the ill body-alive and well while living with a life-limiting illness. I am director of a hospice program and would also be interested in seeing the above mentioned six measurable goals. So, this may or may not be a surprise to people. I have been directly affected by the stigma attached to mental health care. It was absolutely the biggest factor of my apprehension and successive years of not seeking help.